Ian Madin has worked as a geologist with the Oregon Department of Geology and Mineral Industries for nearly 30 years. In his spare time he enjoys riding with Cycle Oregon and sharing stories about the incredibly cool geology of Oregon. Figure 1. View to the west of deep, “U”-shaped glacial valleys where the North Fork of the Middle Fork of the Willamette (left) and South Fork of the McKenzie (right) meet. The ice was flowing from the bottom of the image towards the top. On Day 1, we will be riding through the poorly exposed volcanic rocks of the Western Cascades as we ascend the North Fork of the Middle Fork of the Willamette. We will start out riding in a deep, steep green canyon, like Brice Creek or Canton Creek on later days, but about the time we get to our snack stop at Kiahane Campground, the terrain will change dramatically, as we enter a wide valley with a flat bottom. This valley, and the upper reaches of the South Fork of the McKenzie, have both been carved out by glaciers descending from the High Cascades (figure 1). 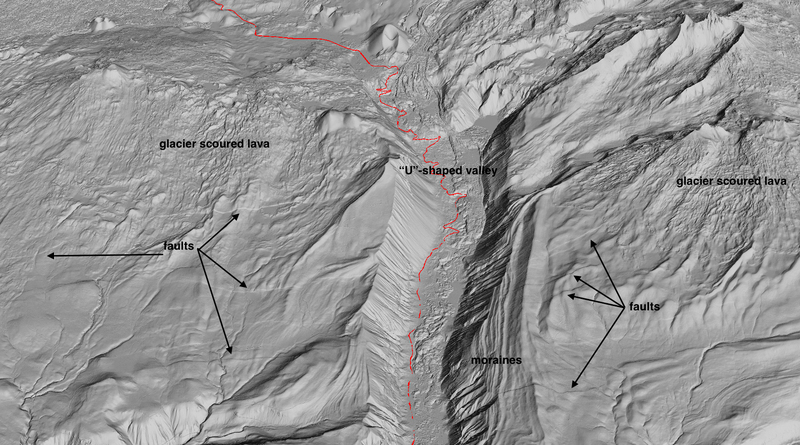 In Figure 1, you can clearly see the broad “U” shape that is characteristic of glacial valleys. Figure 1. Overview of Day 2 route. We will start in the broad valley of the McKenzie River, then turn up Lost Creek and the White Branch of Lost Creek, then climb to McKenzie Pass through miles of barren lava before descending to Sisters and Tumalo State Park. On our second day we will travel through some of the most dramatic and dynamic geology in Oregon, and the scenery isn’t half bad either. The good news is that you will be riding slowly and steadily uphill through most of the best geology and scenery, so you will have plenty of time to take it in. Before we leave Rainbow, you should walk down to the McKenzie River at least once. You will be amazed by the clarity of the water, and we will see similar crystal waters in the upper reaches of the North Umpqua. Many of the Rivers flowing out of the High Cascades have this beautifully clear water. Most of the rocks in the High Cascades are lava flows of various types, but almost all are very porous and very permeable. Porous means that there is a lot of space for water in fractures and openings in the rock, permeable means that those spaces are connected, and water can easily flow through. As a result, much of the heavy snow and rain that falls here every year simply percolates into the ground and fills a giant volcanic sponge instead of running off across the surface. The water travels through the rocks to emerge in large springs which feed rivers like the North Santiam, McKenzie, North Umpqua, Deschutes and Metolius. Lost Creek and the White Branch both disappear into the porous lava for many miles. If you have time on your way home, take a hike along the McKenzie near the Blue Pool, or stop at Clear Lake at the head of the McKenzie and hike over to the Big Springs that feed the lake. Figure 2. 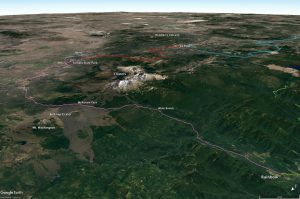 Lidar perspective view to the east, showing our route up McKenzie Pass. As we ride up the glacier-carved White Branch valley, we will cross numerous active faults, ride along one of the youngest lava flows in Oregon, and switchback up to cross the pass through a raw landscape of barren lava. 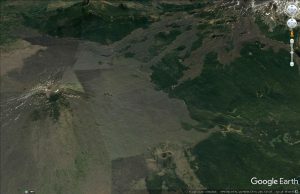 On our way up McKenzie Pass, (Figure 2) we ride past glacial valleys and moraines, dozens of active faults, cinder cones and lava flows only a few thousand years old, all under the shadow of some of the most spectacular High Cascade Volcanoes. The landscape is shaped by the powerful forces of volcanism and glaciation interacting in the very recent past. 20,000 years ago, most of the highlands along the route were completely covered by an ice cap, and the White Branch and nearby valleys filled with thick glaciers. What remains are glacial moraines, glacier scoured lava flows, and deep “U” shaped glacial valleys. 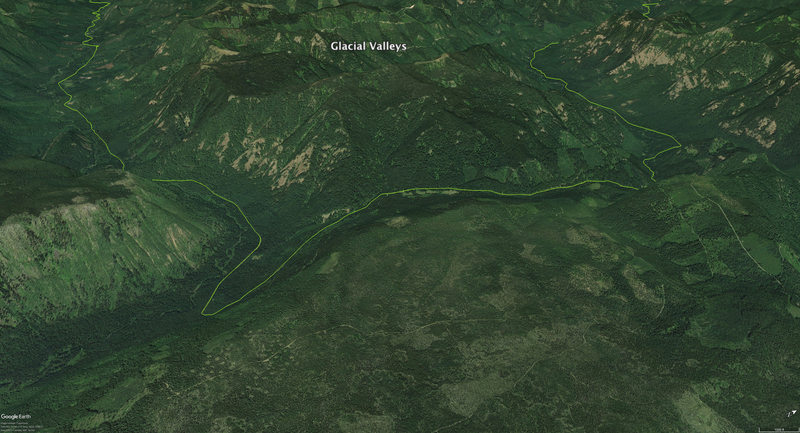 In Figure 3, you can see the classic “U”-shaped profile of the glacial valley; steep straight valley walls and broad flat valley floor. Most of the high plateau above the valley consists of pre-glacial (but still very young) lava flows that were scraped and scoured by the flow of ice across them. This leaves a surface that is not as rough and chaotic as the fresh lava flows, but still retains a very irregular surface, typically dotted with small meadows, ponds and lakes. Although we will not be able to see them from the road, we will be passing an incredible set of glacial moraines as we ride up the White Branch. Rock debris gets incorporated into flowing ice, and where the ices melts away along the glacier front and edges, the debris accumulates into piles called moraines. 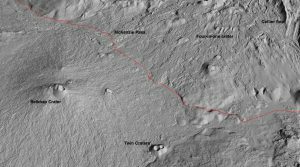 On the south wall of the White Branch valley, and in the highlands on either side, there are beautifully preserved sets of nested moraines, which appear as sets of parallel linear ridges. These record a progressive decline in the extent of ice, with each moraine formed during a period of relative stability, followed by a new and lower moraine after the ice has receded a bit and temporarily stabilized. These types of nested moraines only form when the ice is retreating, if the ice advances, it obliterates all earlier moraines. Figure 3. 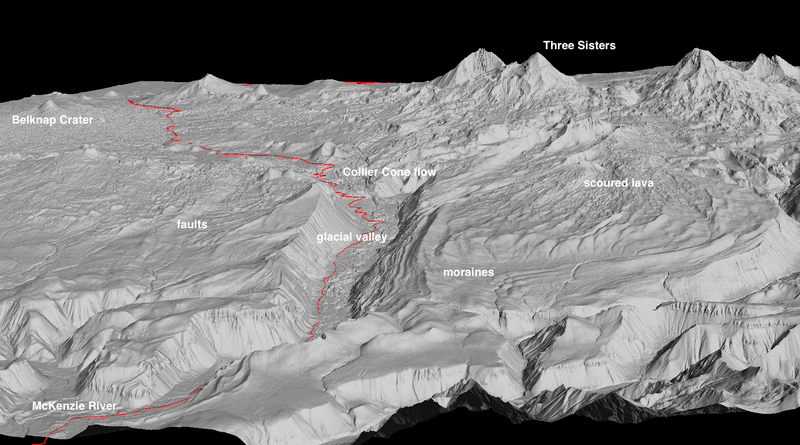 3D perspective lidar view of the White Branch valley showing the “U”-shaped valley profile, glacier scoured lava flows, nested glacial moraines, and active faults. The highlands on either side of the White Branch glacial valley are sliced by dozens of active faults. 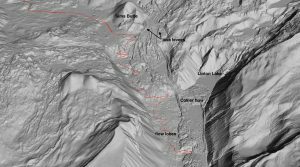 These features were completely unsuspected until they were revealed by lidar collected in 2016. The faults run north south, and must have moved recently, because they cut across moraines that formed during the last glaciation, which ended 20,000 years ago. The most spectacular of these faults creates a 45-foot high wall across the landscape. Geologists have just begun to study these faults to learn their history, but they are some of the most impressive in Oregon. Figure 4. 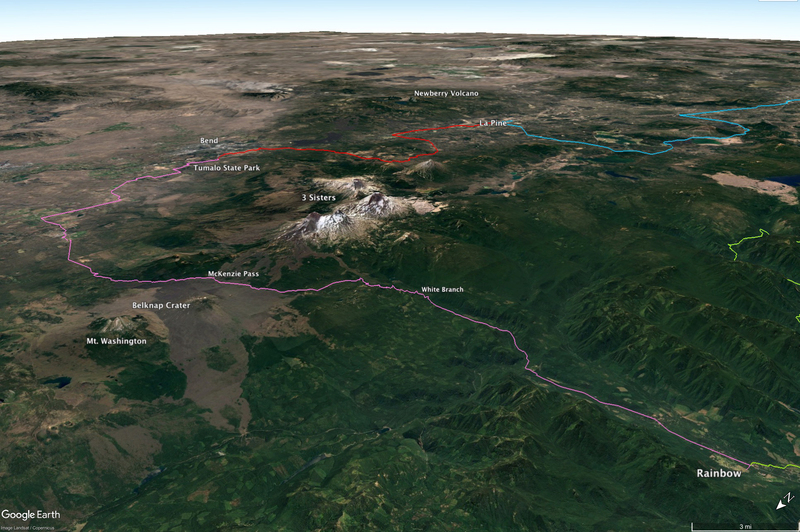 3D lidar perspective view of the switchback section of McKenzie Pass. The Collier Cone lava flow fills the valley here, impounding Linton Lake. The flow shows excellent example of flow levees. Shortly after our morning snack stop, we will encounter the snout of the Collier Cone lava flow. Collier Cone is a cinder cone on the north flank of the North Sister that produced several fluid lava flows 1500 years ago. One flow found its way into the head of the White Branch and cascaded down into the valley, partly filling the upper reaches. 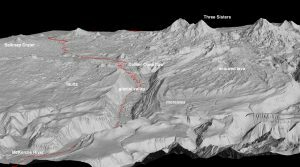 From the road it will appear as a huge wall of lava rubble on your right, and there is a very short hike that will take you on to the surface of the flow, but to really see the cool features, we need to look at the lidar image in Figure 4. The flow has many short lobes, that look rather like molten wax flowing off a candle. It also has pronounced levees along the edges. These are formed when the rate of flow decreases, and the fluid lava drains away from the frozen edges. 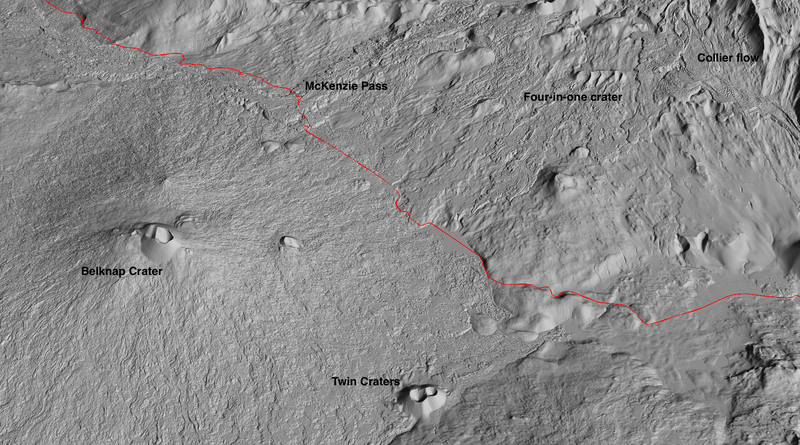 Sets of nested levees show that there were numerous pulses of lava. Linton Lake, across the flow from the highway, was formed when the flow blocked a side valley. At the top of the switchbacks we will pass Sims Butte, a post-glacial cinder cone, and after a few miles we will enter a stretch of lava barrens that extend all the way to the top of the pass at the Dee Wright Observatory. These young lava flows came from Belknap Crater to the left, and from Four in One, Yapoah and Collier cones to the right. Most of these flows erupted about 1,500 years ago and their rough, rubbly surfaces have changed little since then. This is a very hostile environment for vegetation because there is no soil so that snowmelt and rainfall disappear into the porous lava, leaving little to support trees or shrubs. Figure 5. Lidar (above) and Google Earth (below) views of the McKenzie Pass area, showing the young lava flows and vents. Most of this bare lava is only 1500 years old. The highway through the lava fields provides excellent views of the North and Middle Sisters to the south. The North Sister (10,085 ft) was built by eruptions between 45,000 and 140,000 years ago, while the Middle Sister(10,047 ft) is only 20,000 to 25,000 years old. Both are heavily eroded by glaciers, but the glaciers are rapidly retreating, and may soon disappear altogether as our climate warms. The Collier Glacier, which occupies the north side of the North Sister, extended nearly to Collier Cone in the early 1900’s. It has retreated about a mile since then. To the north you will see Mt. 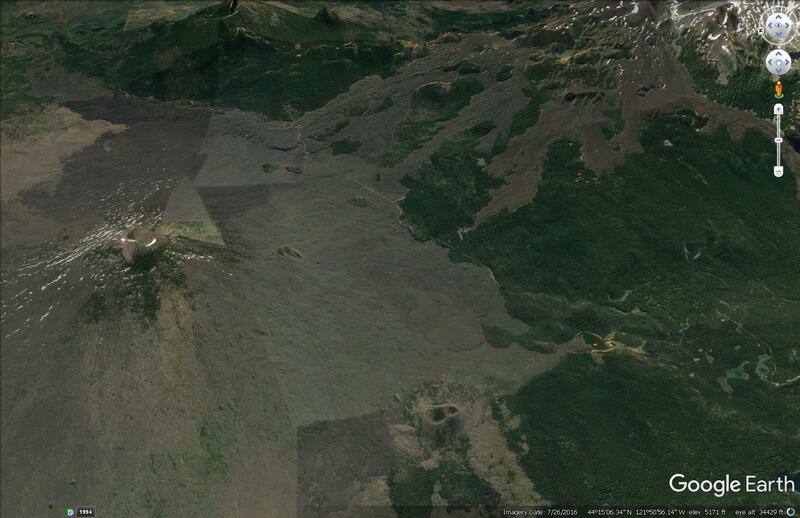 Washington (7,790 ft), the eroded stump of an older volcano, and Mt. Jefferson (10,496 ft) which was largely built over the last 100,000 years, with the most recent eruptions 15,000 years ago.